The Clouds, written by the ancient Greek playwright Aristophanes, is a work of Old Comedy. Old Comedy is a comedic genre that utilizes satire, caricature, and vulgar dialogue to ridicule public figures, politics, ideas, trends, and institutions. The drama is very amusing and entertaining, but it also expresses serious concern about the radical new ideas arising in Athens at the time of the play. 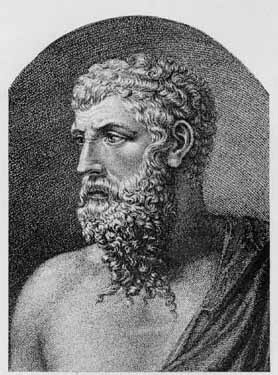 Aristophanes chiefly focuses on the new ideas espoused by Socrates and by the Sophists, and emphasizes the threat these new ideas pose to traditional values and morals. As seen in Plato’s Apology, accusers charge Socrates with corrupting the youth and not acknowledging the Gods of the State. Socrates references Aristophanes as one of the Athenians who persuaded people to believe these accusations. Indeed, in this play Aristophanes presents Socrates as a man who blasphemes against Zeus and the Gods of Olympus. In the play, Socrates only worships the Clouds and argues that Zeus does not exist. Socrates new teachings threaten to undermine the traditional values of Athens. Perhaps afraid of what may result, Aristophanes ridicules Socrates in an attempt to discredit him so that others may not be persuaded by him to follow his teachings. Aristophanes also targets the Sophists for derision and mockery. The Sophists were associated with specious reasoning and deceptive argumentation. They preached the virtue of argumentative discourse, and firmly maintained that traditional Greek values, such as truth and justice, were relative, and changed according to the needs of men in a particular time and situation. What is right and just in one society may not be right and just in another. Although Socrates denounces Sophist principles and specious methods of arguing, Aristophanes discerns no difference between Socrates and the Sophists. Although Socrates believes that he does not utilize deceptive logic and support specious arguments, Aristophanes disagrees. Aristophanes’ challenge to Socrates is a model which readers of the great books should emulate. Regardless of the supposed intelligence of the writer and superficial plausibility of an argument, readers should not unconsciously accept an argument without further investigation into the logic, validity, and practical application of the argument. Aristophanes demonstrates that no man or argument is inviolable. He advises us to question everything and resolve difficult dilemmas according to our own intuitions and knowledge. We must not relinquish our ability to contemplate and derive conclusions to another person, and must always beware of deceptive reasoning. The speaker may not intentionally deceive an audience, the speaker may indeed be deceived himself by the seductive reasoning. We must struggle and engage with an argument, understand the subtleties, intricacies and premises of it, and finally make a conclusion regarding its validity. This entry was posted in Aristophanes, The Clouds and tagged Aristophanes, Athens, Comedy, Old Comedy, Philosophy, Plato, Socrates, The Clouds, Zeus by orwell1627. Bookmark the permalink. Hey, Steve. Thanks for your reply. Yes, I am familiar with Plato’s Symposium. Aristophanes’ description of love is both comical and profoundly beautiful in that dialogue. Regarding Plato’s attitude towards Aristophanes, I certainly do not believe that Plato possessed the same animosity towards Aristophanes as he did towards Socrates’ accusers at the trial. 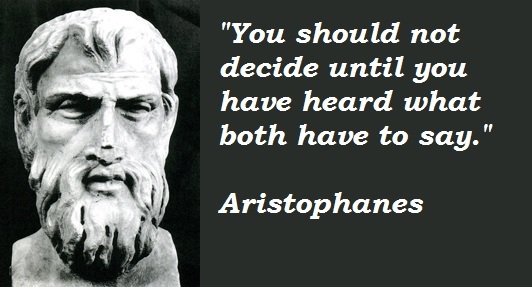 I believe that Aristophanes was actually on friendly terms with both Plato and Socrates. One can certainly disagree with another’s opinions yet still remain their friend. The ancient Greeks, who loved the art of debate, realized this fact perhaps more than any other civilization. This may sound like an empty response, but how I would love to sit in that amphitheater…. I have seen it so much in books and colleges that I could die happy if I would see it in real life. Kudos…I will take this and read it again because I really liked your argument regarding seductive reasoning. Well this is a very pleasant surprise! I love reading anything to do with “The Old Ones”. My words, of course. But your argument is lovely and I appreciate you taking the time to write them. Thanks! Anyways, I just wished to go with you on your blog.